Theos KE Polemos: Greek for God KE (Kinetic Energy) War. The significance of KE, in the title, representing the violent collision of war and spirituality, however an acceptably straight forward interpretation is simply God and War. Theos KE Polemos is a story of the destruction, the resurrection, and the redemption of the spirit of man. The manifestation of karma and dharma on a grand scale under the specter of an unseen enemy so terrible it brings madness to those who seek to confront it. It is an epic story about the deepest flaws and the greatest heights the expression of humanity can achieve. Below is a small glossary of terms that will appear often in the descriptions of Theos art in the galleries. Terms will be likely be added here and there for your understanding. This is only a small sample of the Theos universe. Badan: The mythic holy war that occurred in the distant past of the Sol System. Whether it was a real event, or not, on many levels this legend shaped the disorientated future to come. In the struggle against the faced that is the war on Polemos, rebels have revived the Badan in name and have begun to ignite the mythos once again. Basilea (ancient Greek for Kingdom): The kingdom of God. The metaphorical seat of Havona, The Isle of Paradise. According to the Badan legend it was rumored to be a giant vessel crafted from an asteroid by an unknown agency, one of seven each with a sentient consciousness who's purpose is to commune with planetary systems in order to facilitate ascension. Blid Krieg: A mutation of old world German Blood War with Krieg remaining intact. On Polemos 12 FOIL squads are called Blid Kriegs, typically 8 infantry FOILs and 4 Cavalry FOILs. Dies (Dees): Highly respected manufacturer of shettiers, FOILs and sendai systems. Dies has also managed to secure a place in history as nearly matching Oshen in quality of Teadi and FOIL systems. FOIL (Faedai Omni Icar Leviathan): larger sendai style body frame, with a sendai entity residing in it's headcase, capable of carrying a human pilot. The human pilot and the FOIL sendai are mentally joined. Almost all sendai FOILs have individual names, personalities, and communicate audibly to their pilots and to other FOILs. FOILs are mainly a Polemos based weapons system because they are simply too big for Indus's claustrophobic environment. There are also FOILs designed for space combat as well, these are the only FOILs, stationed at the surface only, on Indus. Geind (gynd): 1:Major and important manufacturer of Polemos FOILs. 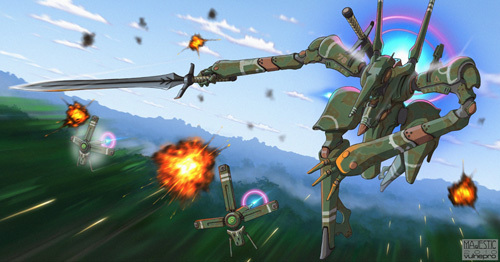 Geind FOILs are extremely effective machines in combat and are very wide spread in the Polemos campaigns. 2: Political Bloc on Indus who funds and is the central power behind the Polemos Geind FOIL plants. Germane: Powerful political bloc on Indus with bloodlines still managing to survive from the ancient Germanic people. Indus: The forth planet in the Sol System. Its name is derived from the Indus valley and is also a metaphorical reference to the industrial nature of the planet. A fully industrial and resource depleted architectural hall of mirrors. Indus is "The Eye of Sol" the center of control over all the inhabitants of the Sol System. Jiendel: One of the 'Big Two' manufacturing corporations on Polemos. Along with Vulne, it's main competitor, Jiendel manufactures high quality combat FOILs, various weapon systems, cyborg bodies and parts, sand rails (cars), and large space freight craft. Lucia: The "second sun" of the Sol System, the Black Sun. Lucia is a dwarf star that orbits Sol in the fifth position of its solar family. Some believe Lucia was once a planet like Halis. Nues (noos): The solar-wide news dissemination system via the omnisense netwerk. Nues broadcasts are live generally but also extremely controlled and censored in content. The Nues shows what those in power want you to see. Nues is filmed mostly by mobile sendai optic platforms linked to omnisense. Omnisense: The Solar-wide optic monitoring netwerk. Omnisense is, as the name implies, everywhere. A netwerk of optic-camera systems that are all inter-linked and monitor the lives and movements of the people of the Sol System. Oshen: A corporation renowned for the development of the taedi strain of the sendai. The founders of Oshen took the bold step to create a stable sendai combat and policer application to replace the instability of the more widely used sadus partners at the time. They perfected the use bond and have now become the preferred choice in these applications over the saedi. Oshen has since grown as a recognizable brand name and continues to make taedus machines of the highest quality. Policers, bounty hunters, and warrant agents are Oshens largest client base. Other larger companies have also moved to manufacturing taedus systems but few-to-none have matched Oshen in reliability and quality. Oshen has also manufactured a limited number of taedi FOILs for Polemos combat. These machines are extremely rare and are most sought after. The only problem is the machines will not bond with just any pilot. It has to be specific human qualities the taedus central brain will respond to. Gumbee, a taedus of legendary stature, and Anemos, the FOIL of Endiel Koh are manufactured by Oshen. Polemos (anceint Greek for war): The third planet of the Sol System. A world in stark contrast to the industrial claustrophobia of Indus. Polemos is embroiled in a war with Indus for independence from her control. Shettier: Category of which the majority of hand weapons fall under. Flichette firing weapons of varying kinds used by humans, sendai, and FOILs. These weapons are often called "lighters" in slang usage. Vulne Consortium (valn): The largest and most powerful manufacturing entity on Polemos. Vulne manufactures FOILs, sandrails, wallriders for Indus, cyborg bodies, sendai, shettiers, large freight spacecraft, and various other products. Vulne is also the central body of the Vulne Consortium, the political and corporate affiliations fighting against Indus's campaign for Polemos's submission to Indus rule. (note our studio's name came from Vulne in the story although we separate the two in concept).